How Larry Thorne went from Nazi to officer to U.S. Army hero while building one of the most badass legacies in the history of modern warfare. 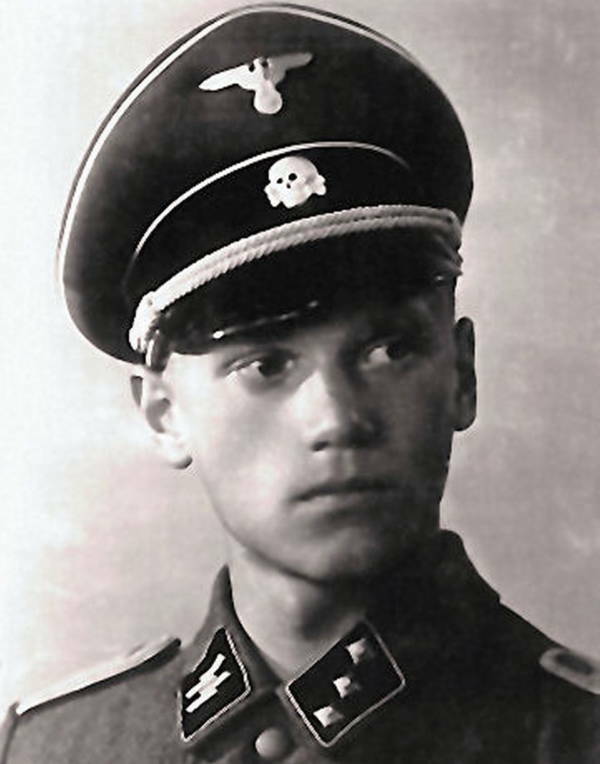 Lauri Törni (later Larry Thorne) poses in his SS uniform. 1941. In Section 60 at Arlington National Cemetery in Washington, D.C., amongst the thousands of rows of white granite headstones for American soldiers killed in action, stands a marker bearing the names of four servicemen killed in Vietnam. At first glance, there’s nothing remarkable about the stone, one so similar to the countless others at this hallowed ground. Even the name at the top of the headstone – Maj. Larry Allan Thorne – is not unusual. It sounds quintessentially American, especially when compared to the names of the three South Vietnamese soldiers who are buried with him in this collective grave. However, Larry Thorne was not this man’s given name. The deceased, though a legendary U.S. Green Beret of incredible courage and fierceness, was actually Finnish. Larry Thorne was born Lauri Allan Törni in Finland’s Viipuri Province in 1919 and fought for his homeland against the invading Soviets during the Winter War and Continuation War at the outset of World War II. Because the Continuation War was a joint effort between Finland and Nazi Germany against the Soviet Union, Törni was able to train with the Nazi SS, where he was recognized as a lieutenant. But after the war ended, Törni emigrated to the United States, where he joined the Army and eventually became a Green Beret — making him the only former Waffen-SS officer to be buried in Arlington National Cemetery. Even setting that aside, the story of Lauri Törni/Larry Thorne is a remarkable one. From birth, it seems as though he was destined to be a warrior. He joined the Finnish Army as a teenager in 1938 and fought off the Soviet invasion in the Winter War (1939-1940) and the Continuation War (1941-1944), rising to the rank of captain and earning the Mannerheim Cross, Finland’s equivalent of the Medal of Honor. In between the Winter War and the Continuation War, Törni trained with the Nazi SS in Austria. Throughout, Törni was an effective guerilla fighter of such skill that the Soviets put a bounty on his head because of all the casualties that his unit inflicted upon them. There is reportedly no record of the Soviets doing such a thing for any other Finnish soldier. The bounty was worth about $650,000 and, apparently, no one ever tried to collect. 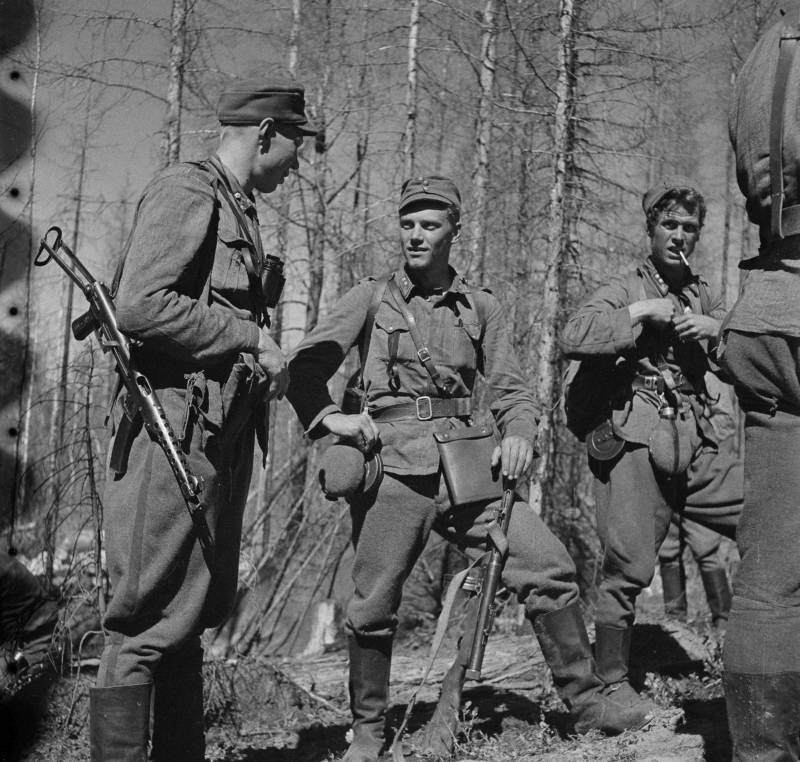 As a member of the Finnish Army, Lauri Törni (later Larry Thorne) stands among other soldiers near Russia’s Lake Tolvajärvi. Date unspecified. Later, after the Continuation War ended but the larger conflict of World War II was still raging, Törni sought to keep on fighting the Soviets. And while Finland had ceased Continuation War hostilities with the Soviets after coming to a territorial agreement, Nazi Germany was still at war with the Red Army. So, Törni joined up with the Germans again in 1945 before being captured by Allied forces as the war was coming to an end. They placed him in a POW camp, but Törni, true to form, escaped and made it back to Finland. After World War II, he eventually made his way to the United States, changed his name to Larry Thorne and joined the U.S. Army in 1954, thanks to the Lodge-Philbin Act, which permitted the recruitment of foreign nationals into the U.S. Armed Forces. The newly christened Larry Thorne was befriended by Finnish-American officers who recognized his abilities and directed him to the Special Forces. There he became an instructor and taught skiing, survival, mountaineering, and guerrilla tactics. Eventually, he attended airborne school and earned his silver wings as a Green Beret. He also went through Officer Candidate School and was commissioned as a first lieutenant, rising from recruit to officer in just three years before being promoted to captain. Still in fighting form in his mid-40s, Thorne served with the 10th Special Forces Group in West Germany as part of a search-and-rescue unit. He earned a reputation for fearlessness in leading operations to recover bodies and classified documents from a crashed airplane in the Zagros Mountains of Iran. In November 1963, Thorne was sent to Vietnam. He served two tours and earned a Bronze Star for valor and two Purple Hearts. He continued to build his reputation for bravery by taking on difficult assignments and leading his men with courage and distinction during several tough operations. For example, during his final tour as part of the 5th Special Forces Group, Thorne was leading a covert mission against a Viet Cong stronghold in Laos on Oct. 18, 1965. He was flying in a South Vietnamese Air Force H-34 helicopter when the weather turned bad. Caught in heavy fog and rain, Thorne would not order his chopper to leave out of concern for the men on the ground that his chopper crew was supporting. This is exactly the kind of courage and leadership for which Larry Thorne was known — but this was also his final mission. The weather grew so bad that the chopper crashed into a mountainside and all on board were killed. 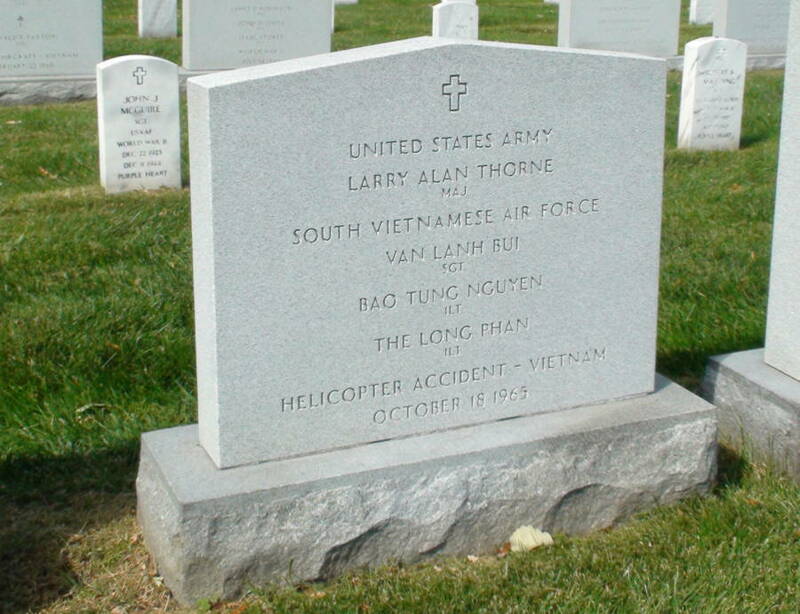 The tombstone of Larry Thorne sits in Arlington National Cemetery in Washington, D.C.
Thorne was 46 years old and had just been approved for promotion to major. He received that rank posthumously and was awarded the Legion of Merit and Distinguished Flying Cross. His remains were not located until 1999. Even then, military authorities were not sure it was him. He was eventually identified by his dental records and his remains were interred at Arlington National Cemetery on June 26, 2003 with full military honors. Thorne’s remains were intermingled with those of the three South Vietnamese Army soldiers who were with him on the chopper. They were all buried at Arlington under a single headstone that bears the names of Larry Thorne and the three other men: Lieutenant Bao Tung Nguyen, First Lieutenant The Long Phan, and Sergeant Vam Lanh Bui. It’s not every day that you’ll hear an American officer say such things about a man who once wore the uniform of the Nazi SS. After this look at Larry Thorne, see some of the most powerful images captured during the Winter War. Then, read up on Winter War hero Simo Hayha, the “White Death” and the man who may have been the deadliest sniper in history. This man has an amazing history. Lyrics for the song in the post that follows. Last edited by chijohnaok on Sun Apr 22, 2018 5:27 am, edited 1 time in total. As his family had been evacuated from Karelia, Törni sought to rejoin them in Helsinki but was arrested by Valpo, the Finnish state police; after escaping, he was arrested a second time in April 1946, and tried for treason for having joined the German army. After a trial from October to November, he received a 6-year sentence in January 1947. Imprisoned at the Turku provincial prison, Törni escaped in June, but was recaptured and sent to the Riihimäki State Prison. Finnish President Juho Paasikivi granted him a pardon in December 1948. Törni hired on to a Swedish cargo ship, the MS Skagen, destined for the United States in 1950. While in the Gulf of Mexico, near Mobile, Alabama, Törni jumped overboard and swam to shore. Now a political refugee, Törni traveled to New York City where he was helped by the Finnish-American community living in Brooklyn's Sunset Park "Finntown". There he worked as a carpenter and cleaner. In 1953, Törni was granted a residence permit through an Act of Congress that was shepherded by the law firm of "Wild Bill" Donovan, former head of the Office of Strategic Services. The President of the United States of America, authorized by Act of Congress, July 2, 1926, takes pride in presenting the Distinguished Flying Cross (Posthumously) to Major (Infantry), (then Captain) Larry Alan Thorne (ASN: 0-2287104), United States Army, for heroism while participating in aerial flight heroism against a hostile force while participating in aerial flight on 18 October 1965, in the Republic of Vietnam. Major Thorne was operations officer responsible for launching a small, combined reconnaissance patrol on an extremely hazardous mission into a suspected Viet Cong stronghold. Due to the extreme hazards attending this mission, including weather and enemy action, Major Thorne volunteered to accompany submission aircraft during the introduction of the patrol in place of the assigned individual. After delivering the patrol to the landing zone, Major Thorne remained with one aircraft in the immediate area to receive an initial report from the patrol on the ground. This report was mandatory since only the vaguest information was available about enemy disposition near the landing zone. If the patrol were immediately confronted by a superior force, Major Thorne would land and extricate the patrol under fire. This was done with total disregard for the inherent dangers and with selfless concern for the ground forces. In so doing, he exposed himself to extreme personal danger which ultimately led to his disappearance and the loss of his aircraft. He had, however, guaranteed the safe introduction of the patrol into the area, the successful accomplishment of this mission and had positioned himself to react to any immediate calls for assistance from the patrol. Due to Major Thorne's efforts, the mission was accomplished successfully and contributed significantly to the overall mission of interdicting Viet Cong activities within the area. Major Thorne's actions were in keeping with the highest traditions of the military service, and reflect great credit upon himself and the United States Army. Haha, I was just reading about Larry Thorne an hour ago. Like most of the awards given to MACVSOG members, the citations read " ... while ... in the Republic of Vietnam .. " .. whereas actually, in Larry's case, he was in Laos. On his last mission, he was flying in a Kingbee, carrying a M1903-A3 Springfield ... the Helicopter and all occupants disappeared, swallowed up by the low cloud cover, never seen again. The FAC aircraft on that mission an O-1 Birddog, also disappeared with all occuplants, none ever heard of again. Larry earned his hole. This mission is described in John Plaster's book "SOG", which I am re-reading. The name of Törni was among others on marble on the of my school. The end date was different from the others, all the others from 1939 to 1945. Törni was noted by his old school. I have read few books about Törni. Apparently he was not for a peace time career. But then I think that his stint in service for Nazi Germany is greatly exaggerated. Törni volunteered to Waffen-SS 1941, but came back to Finland. didn't get a commission as an officer and didn't like to German discipline. The second stint is even more obscure, a German U-boat brought him from Finland January 1945. Finland was at war against Germany at that time and he got six years for treason for that. What he did with the Germans from January 1945 to May 1945 is mostly unknown. Organizing resistance after Russian occupation and such, perhaps. But I don't think that Törni had much Nazi sympathies, he just hated the Communist invaders. And Törni was pardoned 1948. As wulrir mentioned Mauno Koivisto, former president of Finland mentions that Törni didn't keep much discipline in his sissi company where Koivisto was serving. The other complaint was that Törni didn't share information among the troops in during the long range raids. If he would have been eliminated, the others would not have known enough. I think that is a fair criticism. Törni couldn't cope the peace time life, so he went West to make another career, and was apparent good at what he did. A man who couldn't live in peace. Nero, you say his stint with the German armed forces was exaggerated or obscure. Germany awarded him the Iron Cross, 2 class. He must have done something to earn that medal. I find it crazy that I woke up at 4am ... picked up one of the books I'm reading and read about Larry Thorne's last mission at the same time that Chi was making his first two posts this morning about Larry Thorne. It isn't every day I read about this person. It isn't every day Chi posts about this person. One time I developed a theory that the stock market would fall abruptly every time my icemaker stopped working. 4 times in a row it worked. Then my repair guy told me the compressor was just failing and the icemaker turns off when it isn't cold enough.